Searching for a good value meal in theatre land can be a tricky task. When you’re short on time and looking for something to eat, there can be a temptation to go for instantly regrettable fast food. This is where Bi Bim Bap comes in to save the day. 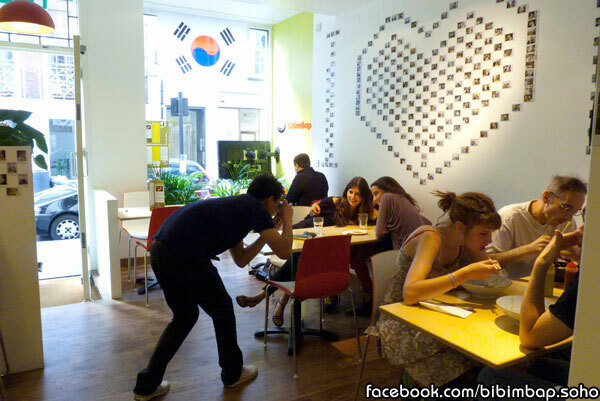 Specialising in its namesake Bimibap, this Korean restaurant provides a tasty meal at a very good price. Bimibap – a dish of meat, rice and vegetables, served in a scorching hot bowl with various marinades and sauces – is quickly becoming one of our favourites. It’s warming and hearty, and the perfect antidote to a cold London night. Bi Bim Bap delivers a faultless example of the dish. It’s a simple and unassuming place, and while the decor does not excite the senses, the restaurant can be relied upon to consistently deliver. If you’re not keen on Bimibap, Korean starters, salads and noodle dishes are also served. If you’re going for a pre-theatre meal, or just grabbing some food with friends after work, Bi Bim Bap is a great choice. If you haven’t sampled Korean food before, start here – it’s delicious. Sometimes a little indulgence is exactly what’s needed, particularly when it’s been a tough week. It was definitely with this in mind that we set off for an extravagant meal at Gauthier in Soho, a French restaurant devised by head chef Alexis Gauthier. Upon entering the restaurant (located in a Regency townhouse) we felt immediately cared for by the considerable staff, who led us into an intimate dining room. With sweet autumnal pumpkins dotted around the tables, and an original fireplace, the room avoided typical fine dining sterility. The staff were constantly attentive, without being overbearing, and we felt completely at ease to enjoy our evening, without a care in the world. Having salivated over the menu online in advance, we both decided to go for the 8 course tasting menu (after sampling delicious aperitifs). What followed was an exceptional gastronomic journey with delightful dishes ranging from foie gras to monkfish and venison. The star of the menu was the risotto, with creamy rice and significant shavings of black truffle delivered at the table; this really was wonderful. The two deserts were also delicious, especially the Mandarin dish, which delivered the flavour equivalent of a piano, with each note singing. Slight downsides to the night were a draft from the cold night outside, and a noisy hen party in one of the fine dining rooms upstairs which spoilt the ambiance somewhat. We also felt the service was a little slow towards the end of the night – we arrived at 7.30 and didn’t leave until 11pm. However, these are minor quibbles about an otherwise wonderful meal. The restaurant is beautiful and the cooking sublime. 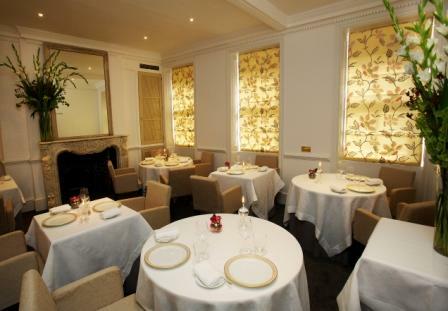 Having recently heard that Gauthier has lost its Michelin star we can’t understand why, as it equally compares (if not surpasses) many of the best restaurants in London. Don’t let that put you off booking. On Monday some friends and I spent most of the day in Yumchaa Tea Shop in Soho putting the finishing touches to a book plan. At lunchtime, we popped down the road to have lunch at Bratwurst – an American style diner serving Gourmet German sausages. Not quite in the mood for sausages, I went for the schnitzel and chips instead (menu). Served up in a cast iron pot on a wooden base, I liked the feel of the place and the way the food was served. We could sit on high stools and watch the lunchtime throngs march through the streets of Soho. However, the schnitzel itself was pretty average. The chicken wasn’t as moist as it could be and it lacked the morishness of a schnitzel I recently had from Maltby Street market. The place was busy though and so it is obviously popular – maybe I made a mistake in not going for the house speciality. If you’ve been, let me know what the sausages are like! The Bratwurst website has a short promo video showing you the food and layout of the place. Whilst the schnitzel filled a space, I have had better in London. But it is a cool idea and the popularity of the place suggests that the sausages might be the way to go. Not adverse to the idea of a return trip. A planning meeting for a book some friends and I have been commissioned to write took us to Yumchaa in Soho for a day of brainstorming. Very much in keeping with modern trends, this lovely little café has sanded floorboards, exposed brickwork and its fair share of vintage looking paraphernalia. It does, however, strike the right balance and manages to stay on the right side of the overly hipster line. Throw in free wi-fi, great coffee and delicious baked treats and you have a winning combination. I can heartily recommend the supremely tasty white chocolate and raspberry muffin, whilst others partook in the fruit breads and were equally impressed. 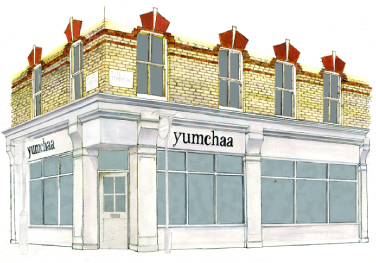 If you are looking for a quiet place to work then upstairs can get a little busy in the afternoon as waves of workers seeking refuge from their desks descend on Yumchaa. It also attracts its fair share of trendy Soho types looking to sample their large and varied range of teas, bags of which are available to take away (you can also purchase them from the stalls they have at some of London’s biggest markets). For more tranquillity, head downstairs and sit back in one of the armchairs. A great find in the hectic, bohemian part of town. Will definitely be going back with my laptop when I need strong coffee and delicious cake to fight through an episode of writer’s block. The only down side was the small problem they have with little fruit flies. Seems to be a bigger problem upstairs than downstairs though. Price: £3.50 – £5.30 for a small main course. When leaving a meeting in Russell Square on Tuesday my colleagues and I set off in search of lunch. The others decided to head to Hummus Bros on Southampton Row down near Holborn Tube station. I can’t say my first impressions of the idea were favourable – hummus has never been particularly high on the list of my favourite foods. However, always open to trying new things, I relented and decided to join them. I am glad I did. Hummus Bros was a delight and, with outlets in Soho and St.Paul’s to boot, I urge you to get down there to sample their wares, even if like me you aren’t immediately drawn to chickpea cuisine. Dishes are served in two sizes – regular and small – and consist of your own individual plate of hummus acting a base with a variety of toppings. Regular meals come with two pieces of delicious warm pitta; small meals are joined by a single slice. I plumped for the chunky beef combination – slow cooked chunks of tender beef to accompany the fresh, homemade hummus dusted with paprika. It was scrumptious, as was my drink of warm, spiced apple juice. After our meal the really friendly staff brought us two small portions of malabi – a milk based desert with date honey – on the house. We also got a small glass of mint tea each for free. That was a great touch and a great marketing technique. Why spend money on expensive advertising when looking after your customers ensures favourable word-of-mouth? I would certainly recommend a trip. Verdict: Delicious. Despite being highly sceptical at first, I was happy to be wrong as it was a great lunch and I will definitely be going back and taking Ruth. They also do takeaway and have several delivery options as well. I look forward to trying the other toppings, such as mushrooms, chicken or guacamole. Yum!